Happy Friday everyone! 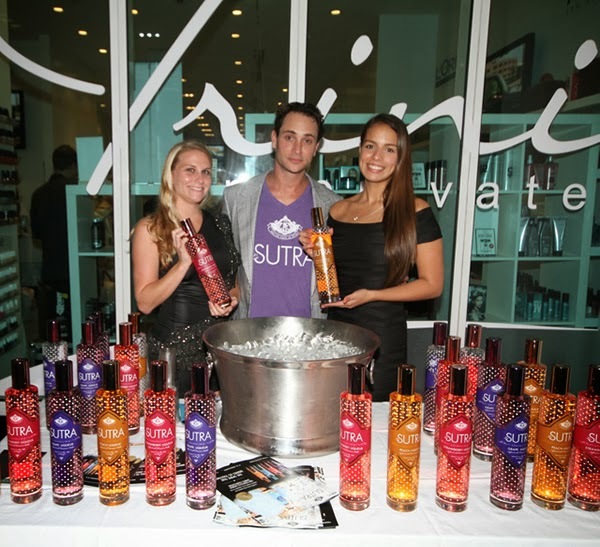 After much Baseling, Miami still came out to attend Trini in Private’s annual holiday event that I hosted alongside Mercedes-Benz of Coral Gables and L’Oreal. 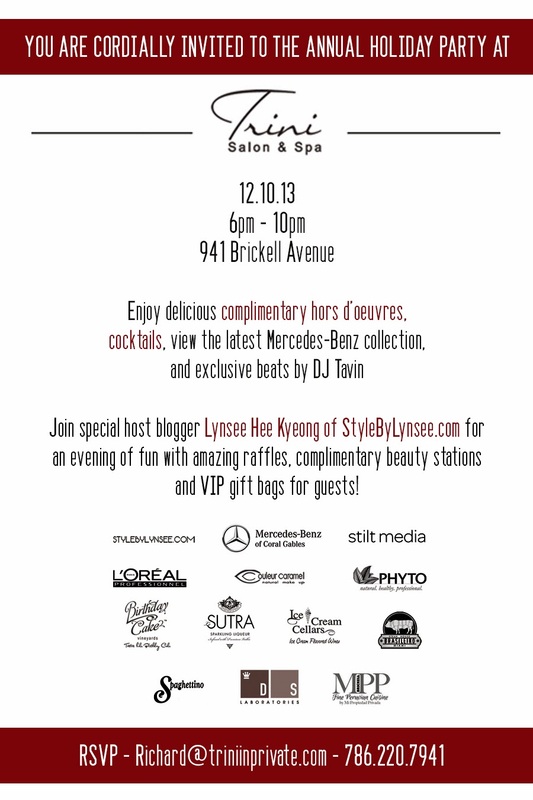 On December 10th, Miami and Brickell’s most elite came out for an evening of beauty, luxury, cuisine and fun. 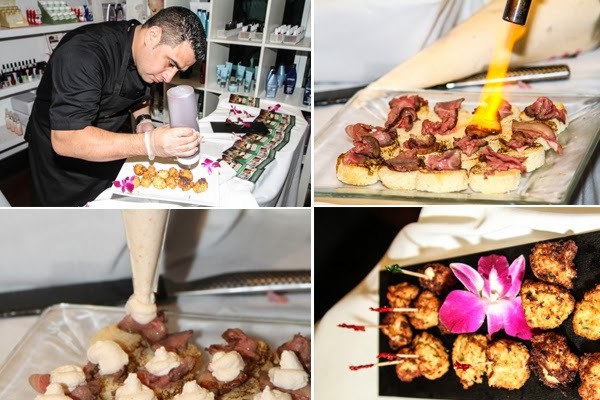 We began the night with light bites provided by MPP Brickell, Spaghettino, and Brasileiro Miami. 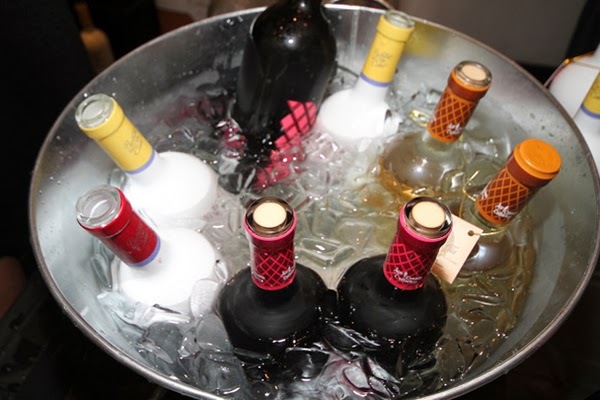 LeSutra sparkling liqueur flowed endlessly, while Birthday Cake and Ice Cream Wines poured up deliciously decadent glasses of wine for all guests. 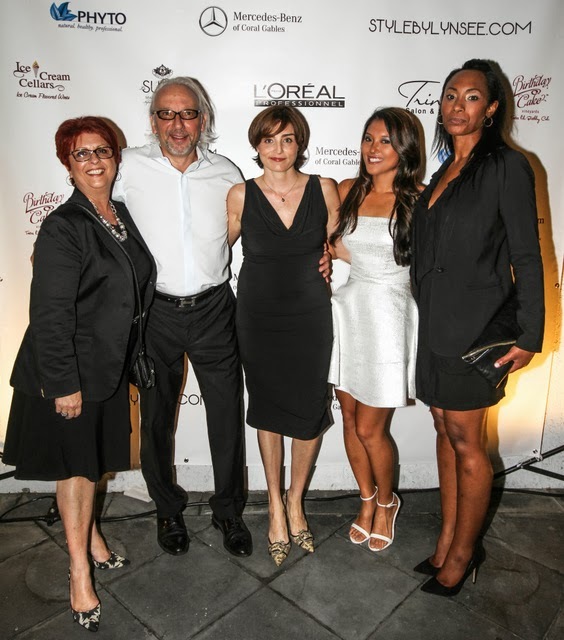 Each guest was greeted with a white rose (an elegant tradition of Trini’s) and a VIP gift bag filled with goodies by PHYTO Hair Care, L’Oreal, and more. 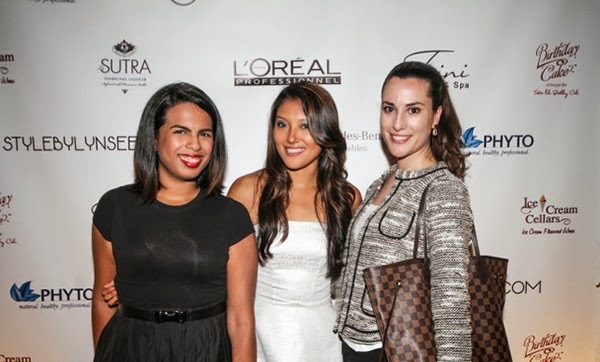 Additionally, guests were invited to their complimentary beauty stations provided by Trini in Private and Couluer Caramel. 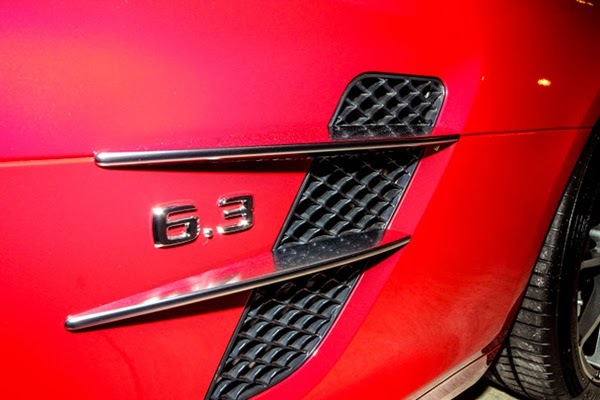 One of the main attractions of the evening was the latest collection of Mercedes-Benz vehicles which were parked elegantly in front of Trini in Private, where many guests previewed the interior of each car. A special thank you to all of my blogger sisters who came out to show their love and support, in addition to all of you who I met at the event. It was such an exceptional experience, and I loved meeting all of you! 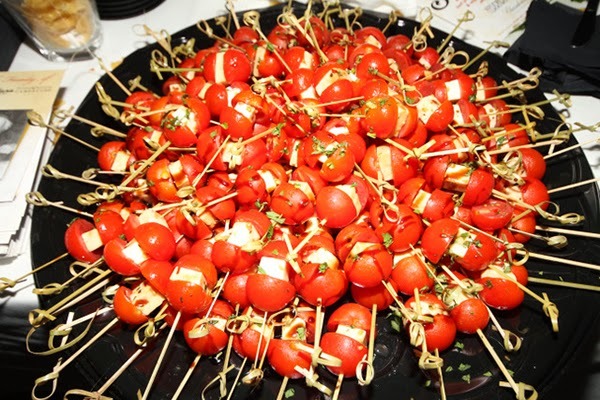 Located in the heart of Brickell, Trini in Private offers an array of relaxing services and their team caters to your wants and/or needs. 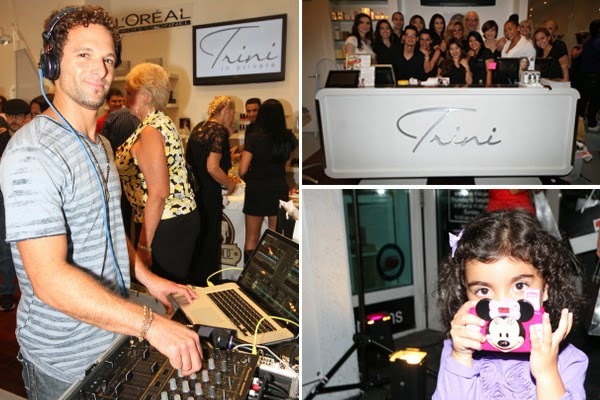 With six locations in Florida, Trini in Private has become the mecca of beauty and salon services. Prior to the event that I hosted, Trini pampered me with a shampoo, cut and blow dry. Additionally, my hair was colored with a chocolate gloss and light highlights which I absolutely fell in love with. I highly recommend going to Marie, who impressed me with her professionalism and skill. It was the quickest and most efficient hair job that I have ever received, and I rarely trust new technicians with my hair! Aside from my hair, Trini also catered to my nails by providing me with a Shellac manicure which was my first time trying this and I don’t think I can go back to a regular manicure after this experience. I’ve heard so many rave reviews about Shellac, and decided to try it for myself after Trini suggested it. It dries instantly and doesn’t chip for at least 10 days. If you’re like me, you have a toddler, or you don’t have all of the time in the world to do your nails, then I suggest trying the Shellac manicure by Trini. Another gem that I discovered at Trini was their Paraffin treatment that was applied to my feet as a warm wax application that made my feet feel like silk prior to a pedicure. Let’s just say this – it does wonders for the ladies who wear heels often. For more information or to find a Trini in Private Salon & Spa near you, visit www.triniinprivate.com. Despite the typical morning routine, we all tend to shift our routine on the weekends (especially during the summer). Let’s admit it, we sleep in later and dress a little more casual when Saturday morning approaches. Check out the video below to see my morning routine on an average summer weekend with me. Have you ever been outside on a hot, summer day and your makeup feels as though it’s falling off your face? Oh, me too. One of the most tried and true methods for keeping summertime makeup light is to either apply a tinted moisturizer or simply wear a thin based foundation with SPF. In this beauty tutorial, I am featuring CoverGirl’s Simply Ageless Foundation with SPF along with a few other high and low end cosmetic items to complete a natural look that is perfect for a warm summer day. This look would pair well with a light-toned summer dress or a bright maxi skirt and a loose fitting graphic t-shirt. Ever since New York Fashion Week, I’ve been swamped with projects so I have to apologize for my brief hiatus from blogging. The weather has cooled down slightly in Miami, but it’s given me a chance to pull out my fall and winter items. One of my favorite ways to build a look together is to piece various textures or materials together to create a unified outfit. For today’s outfit of the day, I paired a silk flowing dress by BCBG Maxazria along with an edgy belt to cinch it at the waist and lace tights. I added a hint of leopard print to add a bit of fringe to the overall look as well. A new trend for the upcoming season is the black and white combination, which I am also loving right now. Therefore, I threw on a bold black and white clutch to accent the look and finish it off. Since I was traveling over this past weekend, I thought I would show you what’s in my travel makeup bag. Of course I don’t like to take all of my cosmetics with me while I’m traveling, but I keep the essential items. I also kept all of these items in one of my Glam Bags since it’s the perfect travel sized bag. Check it out!